The Yukon is located in northwestern Canada and nestles between the Canadian provinces of British Columbia and the Arctic Ocean, with Alaska to the west and the Northwest Territory to the east. The Yukon is a wilderness landscape spanning 187,000 square miles with intense natural design, dramatic mountain vistas, wild rivers, crystal clear lakes and an abundance of wildlife. This diverse region produces habitat that is ideal for one of North Americas largest land mammals, the Alaska-Yukon moose. It is estimated that the Alaska-Yukon moose population currently stands between 65,000 and 70,000 animals or roughly about 2 moose for every resident of the Yukon. A mature Alaska-Yukon bull moose will stand over 7 feet at the shoulder, weigh in around 1,800 pounds and sport antlers that will reach spreads of 65-70 inches, although averages of 58-64 inches are more common. This Canada moose hunt begins in Whitehorse, Yukon Territory, where your host will greet you. After a good night’s rest and a hearty breakfast, you will board the super cub and begin the flight to moose camp. This is a horseback hunt based from a comfortable hunter cabin deep in the Yukon wilderness. Days are spent glassing the valley floors and mountainsides for that special bull. You should also see stone sheep, grizzlies, mountain caribou, wolves and many other species of wildlife that inhabit this paradise. Your host for this hunt has spent many years in his exclusive concession and knows how and where to locate big mature bulls. If you are looking for one of the ultimate hunting experiences, then pursuit of a trophy Alaska-Yukon moose should be towards the top of your list. Call us for details. Questions? 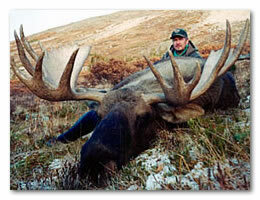 For information or to reserve our moose hunt, contact us via e-mail or call us at 1-800-487-0045.